For the most recent news please visit our Facebook page. Before we show you our new Marquee and Zoom Flags, here is a little bit of the background story behind the purchase. 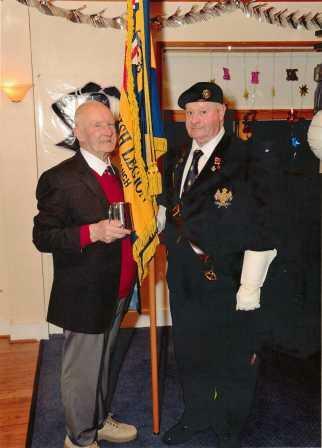 Last year, one of our members, Mr J Deacon, celebrated his 90th birthday with a surprise party. His friends and family donated money to our branch on the night. The Branch were delighted to be invited to the party. Below you will see some pictures of the evening. 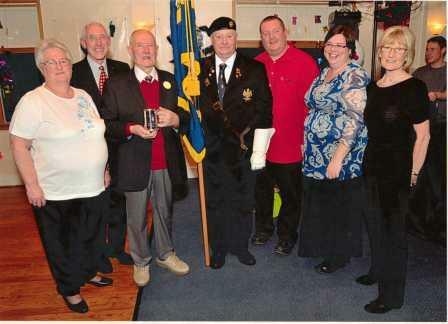 Mr Deacon is pictured with members of the Branch and the Branch Standard. It was decided at a recent Branch meeting, that we would use the money raised from Mr Deacon's birthday, to purchase a Marquee and Zoom Flags for the Branch to use at the various events we attend throughout the year. The Branch are delighted that the Marquee and Zoom Flags have arrived. Below are some pictures taken when we did a dummy run putting up the Marquee. More detailed photographs will be taken when the Marquee is used for our various events this year. This year The Royal British Legion is celebrating it's 90th Anniversary. The Branch will be looking to do something special at this year's Danson Festival. However there are so many other things taking place to help celebrate this anniversary. For more details, please visit http://www.britishlegion.org.uk/about-us/90th-anniversary/our-anniversary. So far the Branch has confirmed that we will be supported by The Riders Branch. We will also be holding a tombola with some very special prizes available, there will be face painting for the children too. Please come along to Danson Festival on the 2nd and 3rd July and support us. Our Poppy Appeal for 2010/2011 has so far raised just over £64,000. We would like to thank everyone who contributed to that total, especially all of our collectors and counters. A big thank you also goes to our Poppy Appeal Organiser Jo Symonds for all her hard work in the Appeal.